“Thinking of atmospheres also returns us to the breath, to the continuous and necessary exchange between subject and environment, a movement that forms a multiplicity existing within the space necessary for sound to sound, and for Being, in whatever form, to resonate” (Dyson, 2009:17). In Collaboration with Anne Goldenberg and Doug Van Nort. Please email mwestby828@gmail.com to confirm attendance with your name and the date you will be coming. The performance is limited to 15 attendants per showing. Both performances will be followed by an informal discussion in the Blackbox. Orbital Resonance is an exploration of internal physiological states of the body, outwardly displaced in light and in sound to create an immersive sensual environment. The performers improvise with sound and movement through breathe, voice, and bodily sensors. The larger environment merges the interactions between various elements (audience, performers, light, sound, architecture, sensors) into a unified, existential orbit. The material produced in real-time resonates back into the space. The traces create their own life, interacting upon themselves for new configurations and interpretations to arise among the spectators. 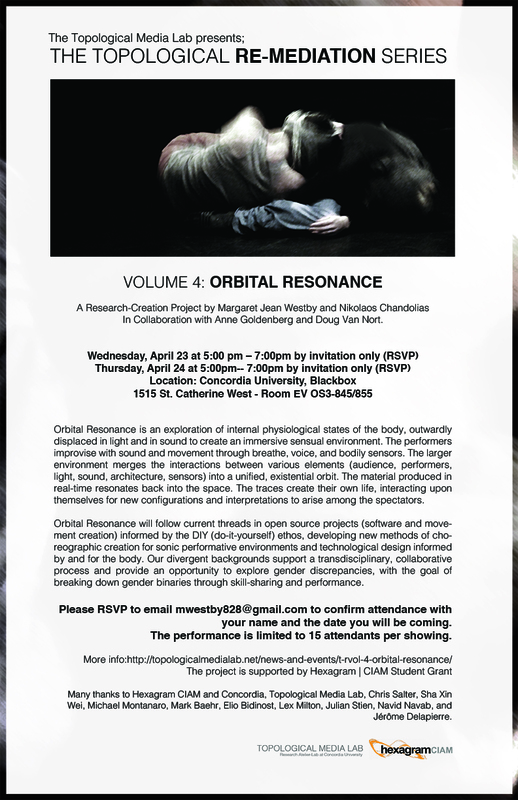 Orbital Resonance will follow current threads in open source projects (software and movement creation) informed by the DIY (do-it-yourself) ethos, developing new methods of choreographic creation for sonic performative environments and technological design informed by and for the body. Our divergent backgrounds support a transdisciplinary, collaborative process and provide an opportunity to explore gender discrepancies, with the goal of breaking down gender binaries through skill-sharing and performance. Margaret Jean Westby is an artist and researcher currently pursuing her PhD at the Centre for Interdisciplinary Studies in Society and Culture at Concordia University in Montreal, Canada. She has created and collaborated in dance performances, installations, and films throughout the United States, Canada, United Kingdom, and Europe. Her doctoral research encompasses both a practical and theoretical approach into exploring strategies to remap gender behaviors, engagement, and inequity in the area of technologically augmented dance performance. For more information, please visit mjmwestby.com. M.Sc in Electrical & Computer Engineering, currently enrolled in M.A., Special Individualized Program (INDI). Anne Goldenberg is interested in the political, epistemic and poetic aspects of collaborative platforms and participative devices. She has a PhD in Communication (UQAM, Montreal) and in Sociology (Unice, Nice) and wrote her thesis on “The Negotiation of Contributions in Public Wikis”. This theoretical work led her to observe the poetics of collective contributions through various forms – multimedia, social sculpture, performance and installation. Inspired by free culture, she mostly explores the relationships between digital material, participative devices, the public and collective action. She facilitates open spaces and booksprints, and likes to make visible, readable and malleable the processes of co-construction of knowledge. Many thanks to Hexagram CIAM and Concordia, Topological Media Lab, Chris Salter, Sha Xin Wei, Michael Montanaro, Mark Baehr, Elio Bidinost, Lex Milton, Julian Stein, Navid Navab, and Jérôme Delapierre.